Geary is a long avenue that stretches nearly the entire length of San Francisco from Market Street all the way out to Ocean Beach. Along the way it speeds through downtown and several neighborhoods all with their own splash of San Francisco-ness. Once it crosses Arguello is becomes the Richmond District which is a large and encompassing area. I get out their occasionally to visit Green Apple Books and figure since I took the exhausting trip on the 38 Geary MUNI bus I may as well make the most of my time here and hit some places to eat, of which there are many. They seem to take up every other storefront as you make your way down Geary and are mostly of the Chinese, Mexican, coffee shop variety. Though every now and then something different appears, in this case GS Riverside BBQ, a small corner spot serving up smoke meat stuff, and of course I am so going to give it a try. Most folks like me keep a list of some sort of places they want to try. From hole in the wall to fancy shmancy places that may require a small loan to dine at. My list is pretty long and just as I take something off 2 more come on to take its place--kind of like the mythical hydra and I trying to be like an eating Hercules getting through them all. It's a Sisyphean task to say the least but I soldier on because I like food and if it's good then all the better. One such place that's been near the top of my list for awhile is Frances. I'd heard nothing but raves about since it opened thus it is a difficult place to get reservations at unless you can go right when they open at 5pm (during the week no less!) but you know folks have jobs and stuff and it's difficult sometimes to make that work. Though me and SO finally got schedules to mesh and made our way their one weekday at 5 night--miracles happen. 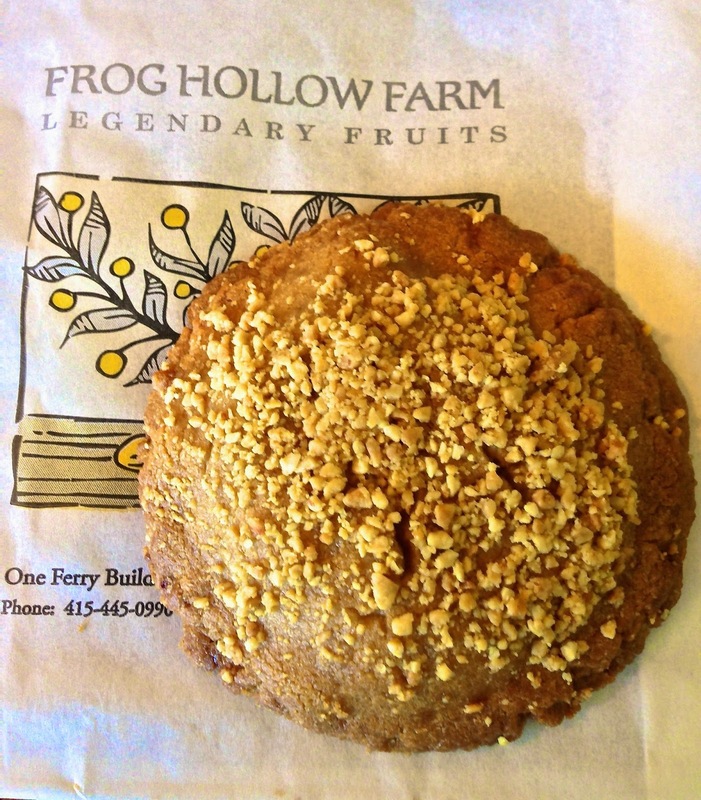 A peanut butter and jam cookie from Frog Hollow Farms at the Ferry Building. This was a delightful surprise--very nutty and filled with homemade apricot jam--tasty, slightly crisp and sweet--I could have eaten more than one. Can't wait to see if they try a different jam flavor because I will try them all. Schroeder's re-invention gets another so-so review this time Le Bauer himself. 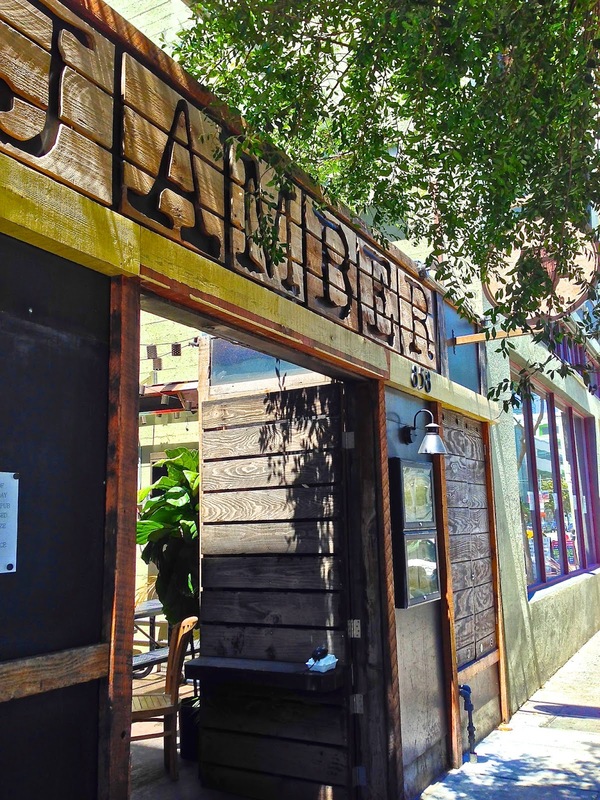 Summer's not over yet so still time to hit up some of the Bay Area's best bbq places. Get your cioppino on at these San Francisco favorites because seafood is good for you. That guy from Benu decided to open a more "affordable" restaurant in Hayes Valley. 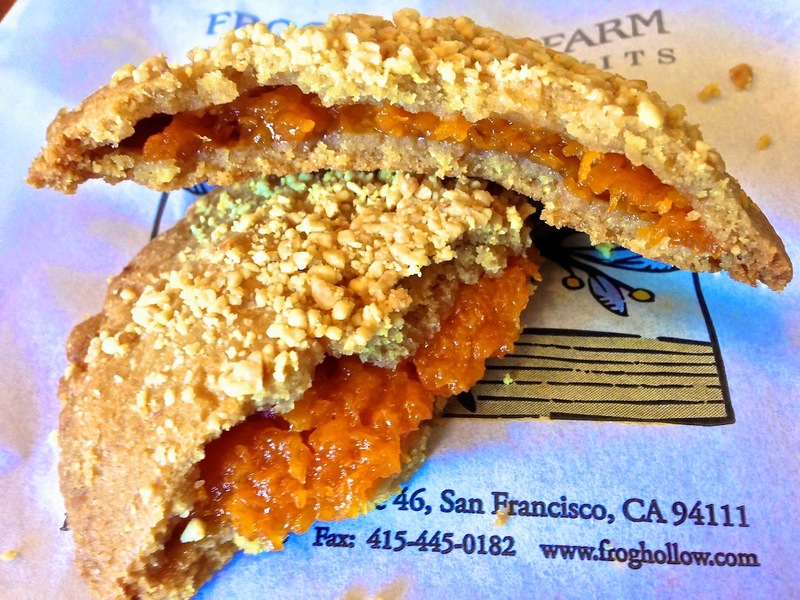 These are Thrillists favorite SF donut shops--though still not totally sold on Bob's. Anonymous doesn't like group b-day dinners. Umm...then why are you going? Another SF stalwart institution is calling it quits after 60 years. In case you haven't been to the new expanded Outerlands (it's so far!) here's a look. Because Southern fare didn't fly at SFJazz now it's Mexican--let's party. Since banh mi's are taking over here's your new cookbook to help it along. 18th and Mission getting brewery. What will this do to the hood and the NIMBY's? 7x7's six ways to taste summer....while it is still summer. SF Weekly's guide to the socially inept cafe just right for you!! Pizza from a truck, it used to be a novelty when Del Popolo hit the streets with a wood-fired oven that was mobile and served up hot pizzas to the masses. Since then several other trucks have come on the scene so it's not such a rare occurrence to come across one at Off The Grid or in this case at SOMA StrEatFood Park. This time around it's Firetrail Pizza truck, which isn't so much a truck as a trailer with a semi-permanent spot here. In this town you can pretty much turn any corner and come across a restaurant you've never heard of. Sometimes they are new, sometimes they've been there for awhile and it's flown under every one's (meaning mine) radar. When this happens I feel out of the loop and think how did I miss this? I was out running some errands one day and while I was heading back home I took a different root (really I was trying to stay in the shade) and came down 5th and made a left on Folsom and walked half a block when I strolled past this little place that had a patio out front. I stopped and took a gander at it and the menu hanging out front. It was called Jamber Wine Pub and I tried to think if I'd read about it somewhere and forgotten or just totally missed the run up to it's opening. I'm going to go with a little of both, lest you think I don't have my pulse on the food scene of San Francisco and I loose any credibility I've built up. Or whatever. I marked this place down on my "to try" list and one late lunch day while I was still gainfully unemployed I made my way over there to see what was the what. Yes, I was back at Sweet Inspirations and had the poppy seed cake with cream cheese icing. If this doesn't satisfy your sweet tooth nothing will and at $6.50 for a slice bigger than anything else you'll get in town it's a real good deal. Oh, and did I say it was sinfully, creamy, yummy? If not, well it is and if you yearning for dessert or have a sweet tooth this place will definitely satisfy you. FoodGal shows you how to make Humphry Slocumbe's "damn strawberry ice cream." Who makes a better banh mi? 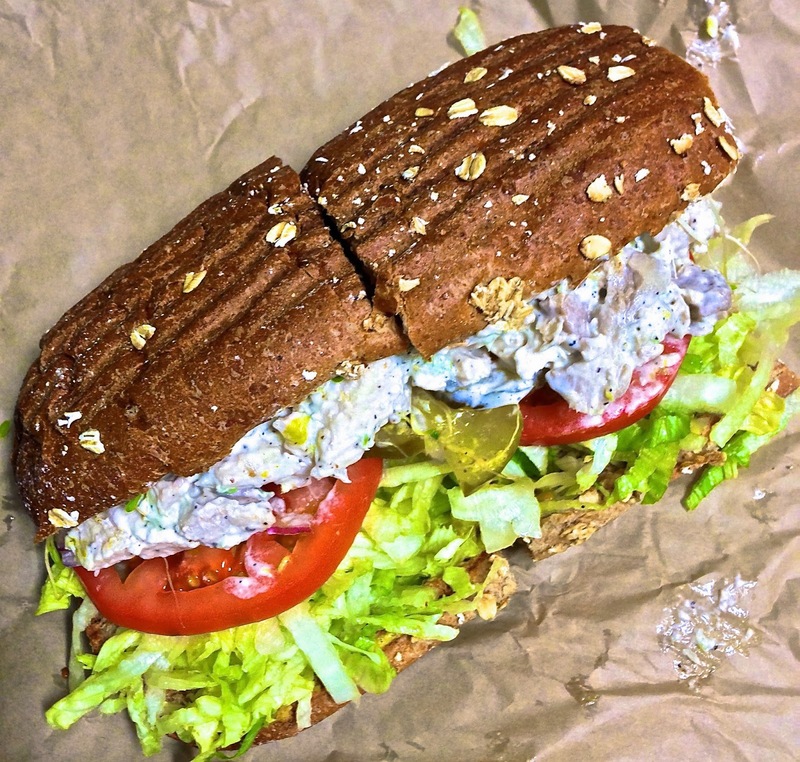 SFWeekly has a sandwich throw down. Who has the better brew and food? It's 7x7's beer hall throw down. Manresa vows to rebuild itself--better, faster, stronger--wait, sorry I mean the fancy restaurant. Tasting Table rounds up the usual San Francisco cheap eats suspects. 7x7's top ten hangover breakfasts in town. Unless it includes saltines and ginger ale I'm out. Alamo Drafthouse is finally making its way to San Francisco--take that Kabuki! 8 fried chicken sandwiches worth searching out in the city. Leave it to Thrillist to combine MUNI and bars into the ultimate citywide drink map. It's time to have tea with strangers! For those who aren't into the coffee thing. Some folks got a look at the (expensive) food to be dished out (sold) at new 49er's stadium. In the great pantheon of sandwiches I'd heard of banh mi's but never really tried one. Then I was in Vietnam and, well, they are everywhere and for about a $1 you get a smallish sandwich with a strip of meat, supposedly pork, with some carrots, some onion, a little cilantro, a pepper or two and a smear of what looks like mayo on a bun with the size and look of hot dog buns. A little street food to just grab and go. Interesting, but mostly, unimpressed. Back here, especially in the last few years, the banh mi has really taken off with any number of placing serving up what I'd like to call a suped big American size version of it. I've had a few since my return and for the most part, I kind of like what's being done. One place in town that's been slinging these banh's for long before it became a fad is a tiny (I mean really tiny) little place called Saigon Sandwich in that lovely part of town called the Tenderloin. At La Farine Boulangerie Patisserie in Berkeley I'd say it's more about the bread (see below) than the sweets. The red velvet wasn't chocolate with red food coloring (like it should be), just regular yellow cake mix colored, plus it was a little dry. The puff wasn't custard but a very light fluffy cream. It was just okay, the shell was a little hard to cut too. Eh...probably should have gotten the cheesecake. And then just as I try La Farine a landlord dispute leads to their sudden closure. A special burger for each day of the week in San Francisco. Get your meat on! Dining out on your Paleo Diet got you down? This place has come to your rescue. New Street Taco place in the Haight. Though not exactly street prices. 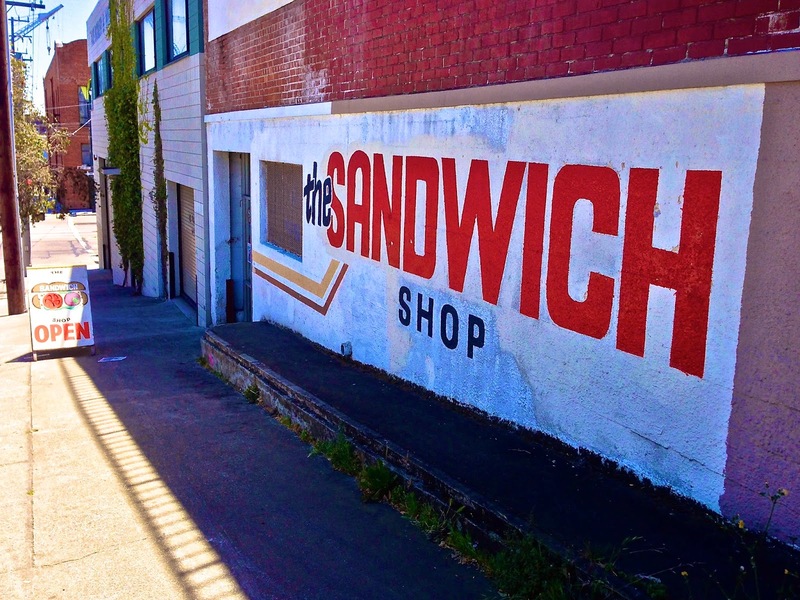 A guide to the best Bay Area sandwiches, if, you know, you want to drop more than $8. BUGS! BUGS! BUGS! It's what's for dinner! Michael Mina's high end sushi (?) place has opened in the Financial District. COOKIES AND ICE CREAM!! COOKIES AND ICE CREAM!! New restaurants to check out this month. Chubby Noodle anyone? SFist likes these 9 hot dogs in San Francisco because...summer and drunkenness. "There is no there there," is a famous quote by Gertrude Stein about her childhood home in Oakland and as you can rightly guess, it is not a compliment. While I don't consider the East Bay a wasteland like she did, I don't get over there much, but not for the reason you think. Mostly I start to think, oh I should pop over there and then I see myself getting on MUNI to BART and the whole idea just exhausts me. So yes, I'm a bit lazy and joining the huddle masses on public transportation is not the most fun thing in this town--I ride it enough to know. But I had been promising my friends and former co-workers CW and CR I'd come over someday and we could all nosh and catch up. Thus it was that I rallied my internal fortitude and made plans to journey across the bay and dine. Only knowing peripheral places over there I left it up to them to pick a spot and didn't put any parameters on what kind of food. After de-BART-ing at Rockridge and jumping in CW's cute tiny car we headed over to try a hotspot and favorite of her's Noodle Theory.